John William Coltrane is arguably the best saxophonist that ever graced this earth. It’s nigh on impossible to find peers, living or dead, who match his virtuosity. He’s even been canonise by the African Orthodox Church. That’s how awe-inspiring Coltrane’s work is. So many will be looking forward to Chasing Trane, a 2016 documentary by filmmaker John Scheinfeld whose previous work includes the political exposé The US vs John Lennon. 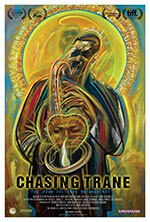 Above is the trailer for Chasing Trane, which includes interviews with Coltrane collaborators such as Sonny Rollins, McCoy Tyner and Benny Golson. The likes of Bill Clinton, Carlos Santana, Common and Wynton Marsalis also provide testimonials, alongside narration by actor Denzel Washington. The documentary, which has the blessing of the Coltrane estate, includes home movies and newly discovered footage of the saxophonist and his band in the studio. Look out for Chasing Trane at your local arthouse cinema — it’s scheduled to receive a limited release.